Can't comment as I was working last night, so not logged on at home. a lot of people here in South Wales are having problems with AOL also. One of my mates on AOL LLU didnt have a connection for 2 days and AOLs excuse was because he has a Sky+ Box lol. The Box has always been connected and is filtered and hes never had an issue before and hes been on ADSL for 4 years nearly. Athlon 64 6000+ AM2 X2, ASUS M2N-SLI Deluxe 570 NForce Mainboard, 4GB DDR 2 XMS2 800Mhz Cosair Ram, 3856.46GB Hard Disk Space, 1GB ATI 4670 HD PCI-E 16x Graphics, 700watt PSU. What's up with AOL this afternoon? Normally the afternoon speeds are fine but they're dire at the moment. 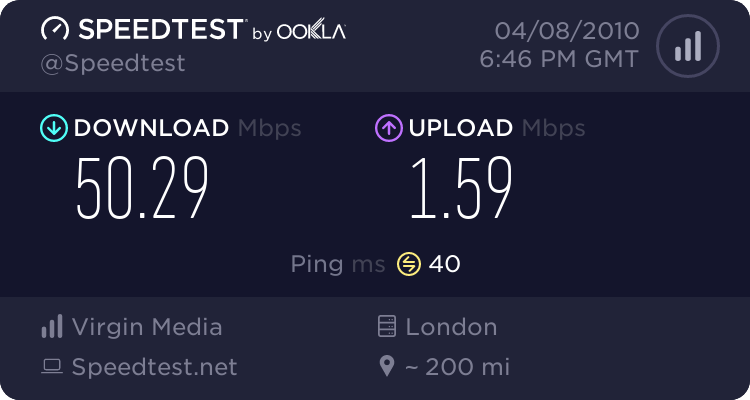 Really strange, considering I used to get problems in the evenings but I normally find I get at least 2Mb in the evenings now, which is much better than the 0.5 - 1Mb that I used to get. But at 3pm on a weekday, it's running at 1Mb! 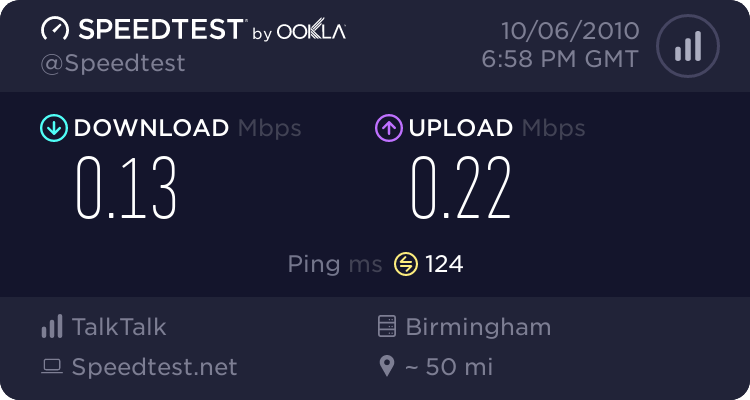 They have slipped considerably backwards in the last few weeks in my view - for about 5 months, evening speeds were consistently good, and now they're back to being consistently average to poor. I hope this is a temporary glitch as it's the Christmas holidays for a lot of schools (yes, already!) and the speeds always seem to suffer during school holidays. For a few years my speed has been stable at around 2.5 - 3.5Mb but in the last few months I am lucky to get a max of 2Mb and in the evenings it's really slow, (it never used to be slow in the evenings for me) I can only assume that CW are cutting the infrastructure to the bone to save cash and it's now just far too many people using too little equipment. I have been with AOL for 10 years but now that they are putting my charges up to £19.99 for a worsening service I shall be looking elsewhere soon! I've noticed the usual thing at this time of year - good speeds in the couple of days before Christmas, good speeds on the evening of Christmas Day and then rubbish speeds in the days after. Especially bad this year as we've got extra bank holidays, so the whole world and his cat is currently online and looking at iPlayer, connecting up the Xbox/Wii/whatever that was received as a Christmas gift.